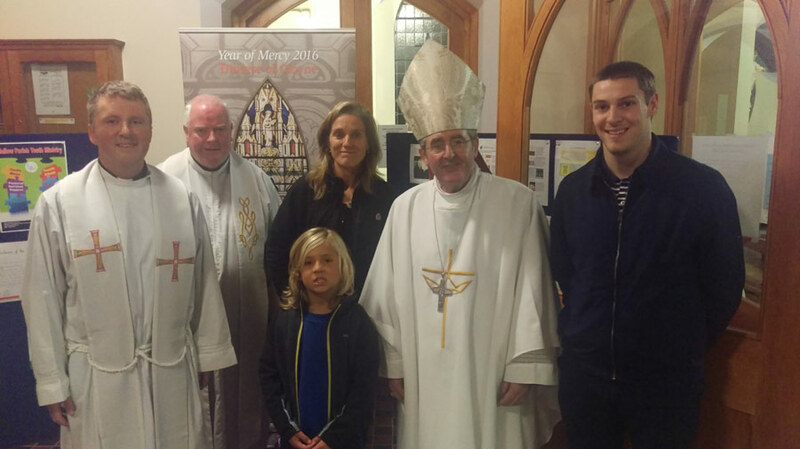 On Tuesday (11th Oct 2016) a large crowed gathered with Bishop William Crean to celebrate Holy Mass in the Church of the Immaculate Conception, Blarney. With faith and great hope, the Mass was celebrated in recognition of the Extraordinary Jubilee of Mercy that Pope Francis has established. The Mass was celebrated to pray for all in the Diocese of Cloyne who support and participate in the mission of the Church today – families, parents, grandparents and godparents; teachers and catechists; priests, deacons, religious and lay faithful. May the Lord give his faithful ones the graces needed to bring his Good News of salvation into our towns and villages. The diocese is grateful to Fr Michael Fitzgerald (P.P. Blarney) and to all in Blarney parish for hosting the event and for providing refreshments afterwards. Thanks also to Fr Sean Corkery and the Adult Faith Development team for coordinating the event. Bishop William Crean was the main celebrant for the Mass. Below is his homily. Some of the most astute observers of people are to be found in the advertising industry. They are continually tracking trends even creating trends to test the market. Their insights and messages are invariably short and crisp – often taking on the character of a mantra. It’s in ads, it’s on their carryout bags. what you need by way of service we have it. This is a form of catechesis – an invitation to a world view and way of living that suits your desire. When we are reflecting on the context for catechesis we need to bear in mind that a multiplicity of catechises are operative in people’s lives. Which is why many are confused even disoriented in life. In the absence of a good foundation for discernment many are swaying in winds of opinion makers. Tonight, our gathering in prayer and reflection around the work of catechesis is an opportunity for you and indeed the Diocese to give thanks for the myriad of choices available to people who wish to be better informed and formed in their faith. I personally am most grateful to the leaders of the groups studying the Catechism of the Catholic Church. I am grateful too for the number of parishes who have established Parish Pastoral Councils. I know that they are at varying stages of development so I pray for their continual growth in their understanding of their role. There are a whole variety of groups who meet for prayer and reflection on Sacred Scripture. “Wherever two or three are gathered in my name there am I in the midst of them”. Those committed to Adoration of the Blessed Sacrament have for decades now kept focus on the power of prayer before the Blessed Sacrament. I am hugely encouraged by the presence of Baptismal Teams in many parishes. It is a vitally important ministry to young couples setting out on life. However, I remain greatly concerned about our preparation for 1st Penance, 1st Communion and Confirmation. Not so much preparation for these sacraments – because teachers do a wonderful job but the apathy on the part of young people and their parents toward practice of their faith. It is fast bringing our celebration of these Sacraments into disrepute. We need to guard the integrity of these sacramental celebrations. As Church in Ireland we have inherited a legacy of faith which we believe has deep roots. It is a shock for those who cherish this heritage to witness what seems like a meltdown. Part of that shock is the realisation that so many are indifferent about things of spiritual value and worth. We are not unique in this cultural dynamic – much of the western world is or has witnesseda similar pattern. It is this pervasive pattern of indifference that has led to the call for a New Evangelisation. The Christian life cannot be legislated for – it comes from choice/decision to respond to the call of God’s love, mercy and providence. Because of the collapse of many structures of Christian faith and living, a new foundation is called for. That’s the rationale for a fresh catechesis that enables people to connect their faith with living in the contemporary world. As we look at this scenario the Book of Sirach (1st Reading) offers real words of encouragement. And a man of great experience will talk sound sense. but the travelled man is master of every situation”. a guard against stumbling, an assurance against a fall. he gives health, life and blessing”. Brightens the eyes, he gives health, life and blessing. Does that sound a lot like Pope Francis? He has awakened the Spirit in many people’s lives. He speaks not of the demands of the Gospel rather the Joy of the Gospel. Laudato Si – his document on Care for the Earth is captured so inspirationally with the term “care for our common home”. And now Amoris Laetitia – The Joy of Love, is an expression of his desire that we cherish life in our families. So we have an abundance of riches to share with a new generation. These riches of insight and inspiration cannot be forced on people. It is for us to invite them in “Come and See” or to go out and witness in our lives the joy that is in our hearts. This task calls for continual prayer and ongoing reflection on what we are about as sharers of the Kerygma. Our proclamation needs to address the desire of the mind to have good reason to say yes in faith. We must also touch the heart and its desire for joy and inspiration. This calls for preparation and planning on a human level but also a deep trust in the work of the Spirit on a spiritual level. Still we know that nothing can beat the witness of a well lived life. To know a man or woman whose life exudes all the Christian virtues is a privilege. This very day we laid to rest in Midleton cemetery such a man – Fr. Michael Campbell. Over these past days it was a sight to behold the vast number of people who sought to pay their respects to this humble and generous man. We give thanks to God for gracing us with the priestly ministry of this wonderful priest. These holy men and women do not often hold positions of influence in the worldly sense yet they are people of great influence by virtue of the fact that they breathe with the very breath of the Spirit of Jesus. So in this Year of Mercy we have good news – the world needs to hear it. Those who are faltering need a word of encouragement to share their faith, to do so with an appropriate sense of pride and confidence. “The Spirit of the Lord has been given to me” (Gospel) so there is no reason for shame rather let us arise from our fearful lethargy and bring the Good News to the world.